BEVERLY — The old actor’s saw applies here: never act opposite children or animals. That’s because they frequntly steal a scene — or in this case — your heart. A talented crew of pre-teens and teens upstages an accomplished crew of professionals in the North Shore Music Theatre’s warm and winning production of “Annie,” now at the theater through July 29. Sudbury’s Lauryn Weintraub, 13, leads the way as Annie, the 11-year-old orphan convinced her parents will one day return to reclaim her, aided and abetted by Piper Birney as Kate, Heather Buccini of Winthrop as Pepper, Maggie Budzyna as Tessie, Elena Carmichael as Molly, Jessica Lewis as Duffy and Joanna Rosen as July. Oh, yes, we can’t forget Mikey, the former rescue dog who plays Sandy. Jacquelyn Piro Donovan of Lynnfield has morphed effortlessly from from the elegance of Dolly Gallagher Levi in the previous “Hello Dolly” to the booze swillin,’ burnt-out Miss Hannigan, who oversees — if that word can be used — the orphanage. Donovan gives the orphans as good as she gets and shines in “Easy Street,” as she schemes with brother Rooster (John Schiappa) and Lily St. Regis (Shanna Marie Palmer) to take Annie away and bilk Warbucks out of $50,000. As the billionaire Warbucks, Raymond Jaramillo McLeod is a bear of a man with a booming bass baritone that you may recognize from a string of Disney movies. 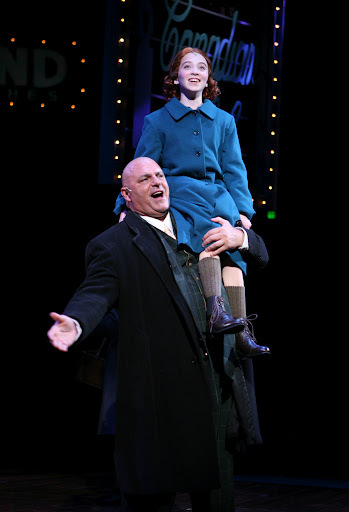 He has excellent chemistry with both Weintraub as Annie and Jessica Tyler Wright as Grace Farrell, his warm-hearted aide who brings Annie into Warbucks’ home. Local favorite Cheryl McMahon of Marblehead plays several roles as a member of the ensemble. Timothy R. MacKabee uses a series of drop-down marquees to give the stage a Times Square feel in “NYC” and the other production values are up to NSMT’s usual high standards, including Charles Coes’ sound design, with the music led by Nick DeGregorio in perfect balance with the singing. Director and choreographer James Brennan keeps the energy high in all of the production numbers. In the years before the theater closed and in the time since it was reopened by Bill Hanney, North Shore Music Theatre has presented a summer show geared to family audiences, and Wednesday night’s performance was heavily tilted towards mothers and daughters, grandmothers and granddaughters, a wonderful sight as theater struggles to build young audiences. If this is the first production your child or grandchild sees, well, Leapin’ Lizards! You’ve made a good choice. “Annie” will be at the North Shore Music Theatre, 62 Dunham Road, Beverly, through July 29. For more information, go to www.nsmt.org.